Try to step back in time and imagine a world without measurement tools. People in ancient times used the different parts of their bodies to size things up. An inch was the width of a man’s thumb, a hand was literally meant five fingers across, a span was the length of an outstretched arm, and the yard in the 12th century was the distance from King Henry I’s nose to the thumb of his outstretched arm. The Egyptians measured the cubit as the distance from the elbow to the fingertips. So this was how they measured the pyramid and how Noah built the Ark in cubits. The Ancient Greeks measured the distance from the tip of the thumb to the tip of the index finger and called it a lick. Calipers are used to accurately measure the distance between two sides of something. It is a simple measuring tool that is very important when you need accurate data about an object. This is one of the most common measuring tools that has been in use for many years. Even if you’re not familiar with the term calipers, you have likely seen one of these in your lifetime. This caliper here is a digital measuring tool, which means that it has a convenient digital display. It’s really handy for making it as easy as possible to read the measurements. If you want to have a caliper that is simple to use and very accurate, then this tool will work very nicely. It is made from stainless steel and will always give you proper data. In many ways, a micrometer is quite similar to a caliper in its design. You use a micrometer very similarly to how you use a caliper. You’ll find micrometers being used very regularly in machine shops and in mechanical engineering circles. It is used to measure the length and depth of an object, as well as how thick it is. If you need to make accurate measurements for engineering purposes, then you will be familiarizing yourself with this tool soon enough. It will be a very useful tool for your purposes. This micrometer is made in a completely analog fashion. It’s durable and will be a reliable tool that you can use for many years. Laser measure tools are used to measure the distance between itself and an object. It is a useful tool when you need to quickly determine how far away something is. Typically, these laser measures are able to give accurate measurements of up to thirty meters. This particular laser measure is a digital model that is capable of measuring up to eighty meters, making it a very sought-after tool. Some people use these laser measures as an alternative to a normal tape measure. It can be used in this fashion, but it is definitely more appropriate for measuring longer distances. This is a fairly expensive tool compared to many of the other measuring tools being shown in this list. It will require a bit of an investment, but it is an important tool to own depending on the type of work that you do. A typical ruler is going to be useful in so many different situations. Everyone knows how a ruler works, as you simply line it up with something to determine how long it is. You have likely been using rulers since you were a child and should have a firm grasp of the concept. Rulers are used for much more than just school projects, though. Professionals use rulers every single day to help with their work. Whether it is an architect using a ruler to help to design a building, or a construction worker determining if his work is straight, rulers are going to be important. You’ll see so many different people making use of rulers on a regular basis. It’s always smart to own a reliable ruler, even if you’re just using it for academic purposes. A compass is going to be a very important tool for many different jobs. If you work as an architect, then you will already be intimately familiar with the compass. It is used to draw circles and can be useful for determining the distance between two points on a map. This is commonly used in shipbuilding as well as carpentry. This won’t be the most common measurement tool that people will use every single day. If you work as an architect, then it will be a vital tool for you to own. Otherwise, it is not something you will need to concern yourself with too much. It has applications for use in carpentry, but you won’t necessarily have to use it all the time. A square is definitely something that will be used all the time by carpenters. A square is an essential measurement tool for professionals to own. It is going to come in handy when you are framing and when you need to find right angles. Everything from cutting lumber to making markings can be aided with the use of a square. You will find a few different types of squares on the market. Some of them will look like a triangle, but the most common type is the one being shown here. It is notable for having an easy to understand “L” design that makes finding right angles very easy. You’ll have a simple time making use of this important measuring tool and won’t want to be without one if you are a carpenter. This is likely the most typical type of measuring device that you will think of when someone brings up a measuring tool. Measuring tape is a simple tool that will help you to measure the length of something. You can also measure how wide an object is and can generally figure out all of the information that you will need to know. Measuring tools like this are commonly used in many lines of work, and you will definitely see one on the hip of most carpenters. These tools are very convenient because they are so portable. You can fit them in your tool belt without a problem and some of them will have a clip so that they can be placed on your belt. Most measuring tapes come with a handy switch that will lock the tape into place. Once you release it, the measuring tape will retract back inside of the casing quickly. It should also be noted that tailors make use of measuring tape to make measurements, as well. The measuring tape that they use has the exact same idea behind it as the measuring tape mentioned above, but it looks different. It isn’t encased in a shell and it doesn’t extend or retract. This measuring tape is simply cloth, and it is used to make measurements along curves as easy as possible. Tailors need to be able to measure the inseam of their client’s legs and other areas. The tape needs to be able to move with the curves of the human body to make accurate measurements. This measuring tape can do just that, and it is an invaluable tool to a tailor because of it. Measuring tape like this is also used to help make measurements in sewing quite often. Checking angles is very important for professionals, and they need to have access to accurate data. In order to pull off a job correctly, you need to make sure that everything is as it should be. An angle gauge is capable of measuring angles so that you can determine if everything is at true level. This is a crucial aspect of many projects that cannot be ignored. Thankfully, buying an angle gauge is going to be a simple solution to this problem. They are relatively inexpensive and are also very accurate tools. 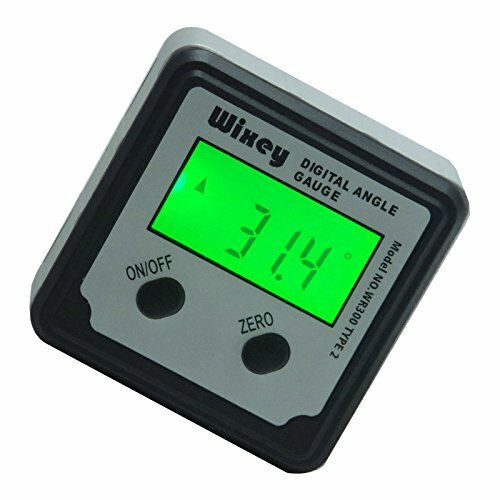 This angle gauge is digital in nature, and it works very well to give you the most data possible. Aside from checking angles, it also functions as a level, making it a convenient two-in-one tool to add to your collection. Owning a level is important for just about anyone. You’re always going to have a need to determine whether or not something is level. Even if you aren’t a carpenter, there will likely be times in your life where you will be trying to hang a picture. You want to make sure that everything is level in order for your home to be set up properly. Using a level is very simple, so you won’t have any trouble figuring it out. This is a measuring tool that can determine if everything is level and balanced. There are many different styles of levels on the market too. This model is a standard beam level, so all you need to do is set it on top of something and then look at the vial to determine if you are level or not. You will also find some digital levels on the market. These can be handy if you prefer to have a digital display. The type of level that is going to appeal to you the most will partially depend on personal preference. You’ll be able to make good use of whatever level you decide to purchase and will always be able to keep your shelves straight moving forward. It’s possible that you might be familiar with protractors from your time in school. These tools are used in mathematics to measure angles and will prove useful outside the classroom for certain purposes. This convenient measuring tool is pretty simple to grasp but it can help to make complex determinations possible. Physicists and scientists often use protractors for varying purposes, so it is a tool that is definitely crucial to many people. Most protractors that you will find on the market are simply made of plastic. Sometimes you will find more durable protractors that are made of metal. Generally, most common people buy protractors to use in geometry courses at their school. It will be used in other academic pursuits as well, but the most common use for a protractor is in geometry class. 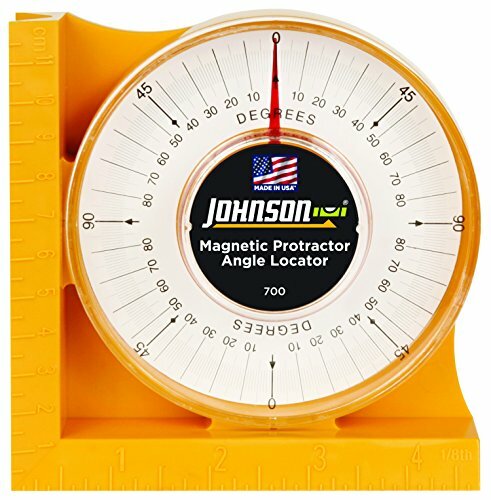 An angle locator is used in construction or carpentry most of the time. It is different from an angle gauge in a few important ways. This is a manual tool with a digital display. You will need to position the two ruler-like ends of this angle locator and use the readings you get to determine your angle. Buying an inclinometer is going to be a smart choice if you need to determine how steep a particular incline is. In many ways, this is giving you the same information as your angle locator would that is mentioned above. The bubble inclinometer differs in the way that it determines and delivers the information. Just by taking a look at this measurement tool, you will be able to tell that it functions differently. It somewhat resembles a kitchen timer, and it works like a level normally would. You place it near the joint that you want to measure. Set the bubble inclinometer to zero, and then determine what the difference is as it goes through its changes. This may not be as simple to use as some of the other measurement tools due to the way that you have to read it, but it does work quite well. Pressure gauges are a really common and crucial measuring tool. These types of gauges are used in many different things, and you will find that owning one will come in handy. The measurement tool being shown here is a water pressure gauge. It determines the pressure of the water that you’re using and is commonly attached to a hot water heater of some sort. You will also find pressure gauges being used to determine air pressure. The most common air pressure gauge that most people will own is a tire gauge. These convenient little tools are necessary when you want to air your tires up to the exact point where they’re supposed to be. Determining both air and water pressure is very important, so you will certainly find a use for pressure gauges in your daily life. Blood pressure monitors actually work in a similar fashion as well. These pressure gauges are crucial for people suffering from hypertension. If you have one of those blood pressure monitors that pumps up to check your blood pressure, then you own a pressure gauge. It’s an important measuring tool that is used for many devices. Thermometers are another measuring tool that you might own already. Of course, thermometers are used to measure the temperature. They can be used to measure the temperature outside but you may also use thermometers to measure body temperature. Many people like to put thermometers on the sides of their houses to keep an eye on the temperature outside. Body temperature thermometers come in different styles. There is the traditional thermometer that is meant to be placed under the tongue, and these are likely still the most common. You will also see digital readout thermometers that work more swiftly than the older thermometer styles. Either option should work great for your purposes, so buy whichever one makes you the most comfortable. The model being shown here is one of the digital thermometers. It will work well to measure the body temperature of both adults and children. You will be able to get a quick and accurate reading using this device. It can be used in any of the traditional orifices that you would use to take someone’s temperature, so it is quite versatile as well. It might seem obvious, but the clock is definitely the most important measurement tool that humanity uses every single day. Clocks are used to measure time and you need to be able to do this to properly complete many tasks. Everyone uses clocks throughout daily life. Whether it is to determine how long you need to bake a cake, or how many minutes you have walked on your treadmill, you will have used a clock before. Various types of clocks exist, but they all provide the same function. Whether you purchase an analog clock or a digital clock, you’ll be using them to tell the time in a similar way. Analog clocks can function mechanically without the use of batteries in some situations, which makes them unique. No matter what type of clock you want to purchase, it will definitely be something that you passively use throughout your day. In modern times, people don’t buy specific clocks as often as they used to. Everyone carries around smartphones with them everywhere in the modern era. Wristwatches were once quite popular but have become a less common sight due to simply not needing them to tell the time. Most people just look down at their smartphone to determine the time of the day as conveniently as possible. Speedometers are very important for determining the speed of objects. Obviously, these speedometers are most popularly used inside of automobiles. If you couldn’t measure the speed that your car is traveling, then it would be very difficult to stay within safe speed limits. Speedometers can be used outside of vehicles as well, for scientific purposes. Police officers use speedometers that are shaped like guns in order to determine if someone is speeding down the road. People also buy standalone speedometers to mount on their personal bicycles. This allows them to determine how fast they are going on their bikes. Measuring speed is definitely an interesting thing, and it is crucial for modern society. Odometers are used to determine how far something has traveled. You should have an odometer inside of your vehicle. This is the gauge that tells you how many miles or kilometers you have traveled. Odometers can also be mounted on bicycles to determine how far someone has traveled while on a bike. This is useful information to know for fitness purposes. Most odometers that you will see on the market are digital in nature. The one being shown here is a digital odometer that is very simple to place on a bicycle. You won’t see too many standalone odometers that aren’t meant for placing on bikes. They do exist, it’s just that this is the most common thing that people purchase an odometer for outside of their vehicles. Another important measurement tool that should not be overlooked is the measuring cup. You can buy sets of measuring cups if you need to measure your food. Measuring cups are most often used for culinary purposes, but there are other applications for measuring cups too. You will find that chemists use measuring cups that are similar to what bakers use in certain situations. The idea behind measurement is going to be the same no matter what purpose you have. Regardless, you’re likely going to want to buy measuring cups for your cooking. Determining how many cups of milk you are pouring into that dish you’re making is very important. Without measuring cups, it would be quite difficult to cook things properly. Some measurement tools fall under the category of medical devices. This glucometer here is a good example of an important measuring tool that people rely on for health reasons every day. A glucometer is capable of analyzing a droplet of your blood to determine whether or not your glucose levels are too high. This is the measuring tool that diabetics use on a daily basis. Keeping your blood sugar levels in check is essential when you suffer from diabetes. Without the information that this measurement tool provides, diabetics would be left guessing on how well they’re doing. This could lead to dangerous complications and would be bad overall. Glucometers are important and the one being shown here even works with a smartphone application to provide additional information.